I saw this idea from Allison McDonald, over at No Time For Flash Cards, and I thought it was really cool… but wasn’t sure how to relate it to Becca. Then one day it hit me. Sentences. Becca is always wanting to write. But due to her very asynchronous development paired with her perfectionism… she is unable to write in a manner that looks correct to her, so she doesn’t enjoy writing. She gets very frustrated. But this way… this way the world is opened to her. I started by taking the Duplos that she already had and writing a bunch of words on them. We did the activity and then we discovered I had inadvertently forgotten to make any prepositions. And we needed color words. And adverbs. And… and… and… she thought of more words than I had ever dreamed of. SO, since we needed to go to Toys R Us that afternoon anyway, we got another set of Duplos. Because truly, we can’t ever get enough of them around here. As of today, she has 169 words and punctuation marks. (And that includes three blocks with ” ‘s ” written on them.) She keeps thinking of more words she wants. I told her that she’ll need to wait a while because we aren’t going to buy any more Duplos right now. She wants me to write words on all of her brother’s Duplos too… which I have also held off doing because his go to specific sets. I love the tenacity with which she approaches building her sentences. Sometimes she likes to build silly sentences just by putting words together that don’t make sense. Sometimes I think of sentences and have her hunt through all the blocks to find the words that are in the sentence. And sometimes she comes up with things on her own that just blow me away. When she wrote “I love my Mommy,” I couldn’t help but smile. 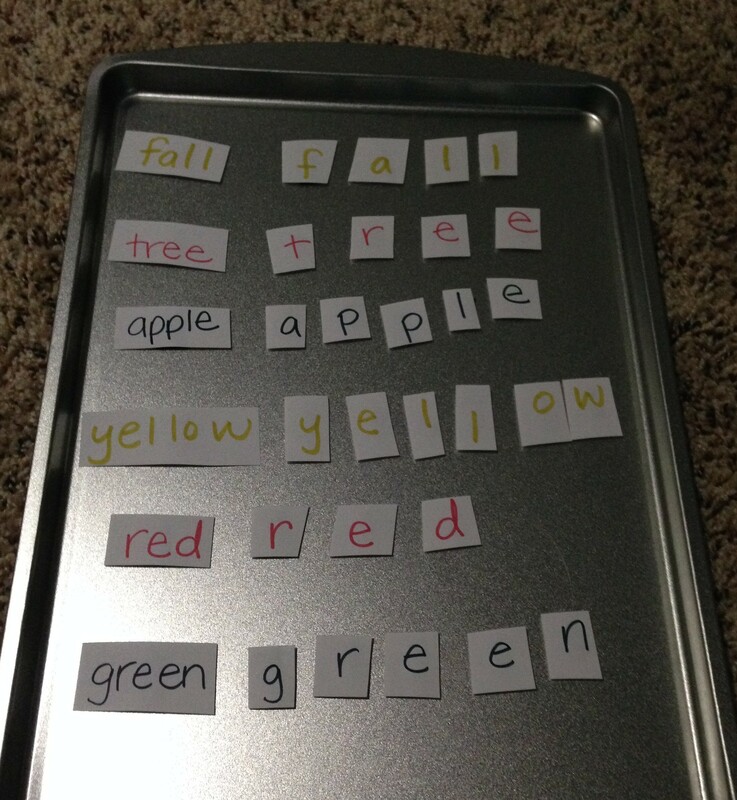 She has discovered that she can also build sentences vertically, and she loves sorting the words by type (which I made easy for her by matching the colors – all the verbs are yellow, food nouns are light blue, pronouns are red, etc.) It’s a great way to talk about types of words, appropriate punctuation marks, sentence structure. She can write stories by building them vertically, or by making them wrap around the table. 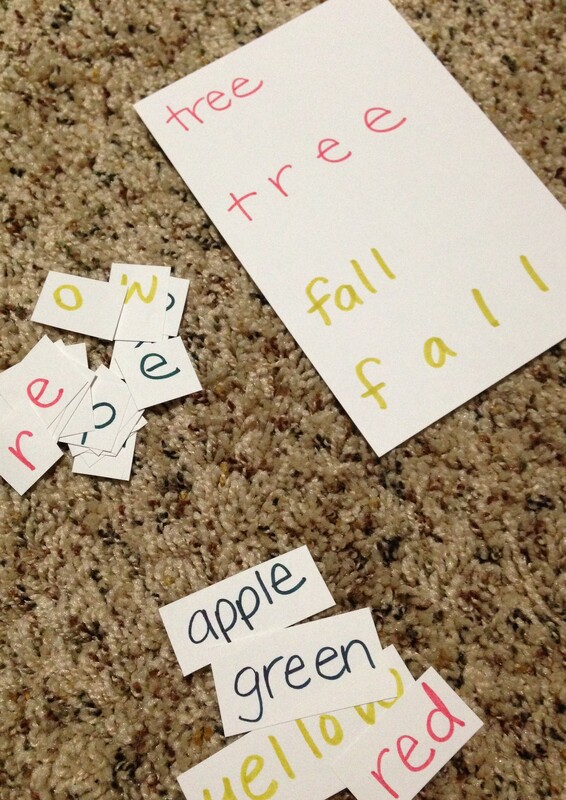 It’s also a great way to practice sight words if you have some words your child is struggling to remember. I love the flexibility that comes with this activity, and that she still has the ability to use her engineering skills to build fun towers as well. For example, yesterday I told her to forget there were words on the blocks, and just build something cool. Then after she was done building, we read all the words in order and giggled at the silly nonsensical story she had written! 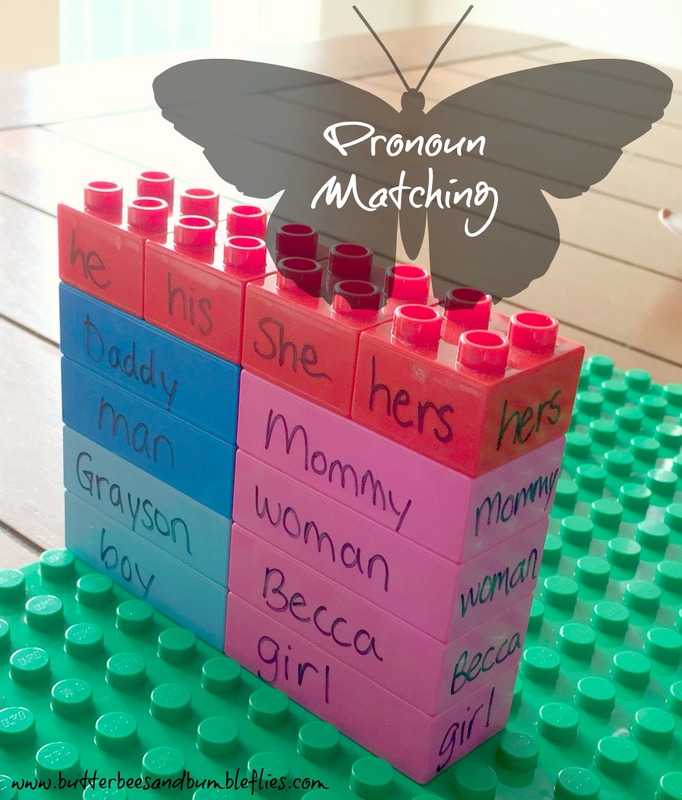 I also made male and female word sets to reinforce male and female pronouns, and that can be an activity in and of itself sorting them into the correct stack. We have a bunch of flat Duplos that I haven’t been sure what to do with… and I think I’m going to use them for math facts. Whatever I decide to do with them, you can be sure I’ll share. 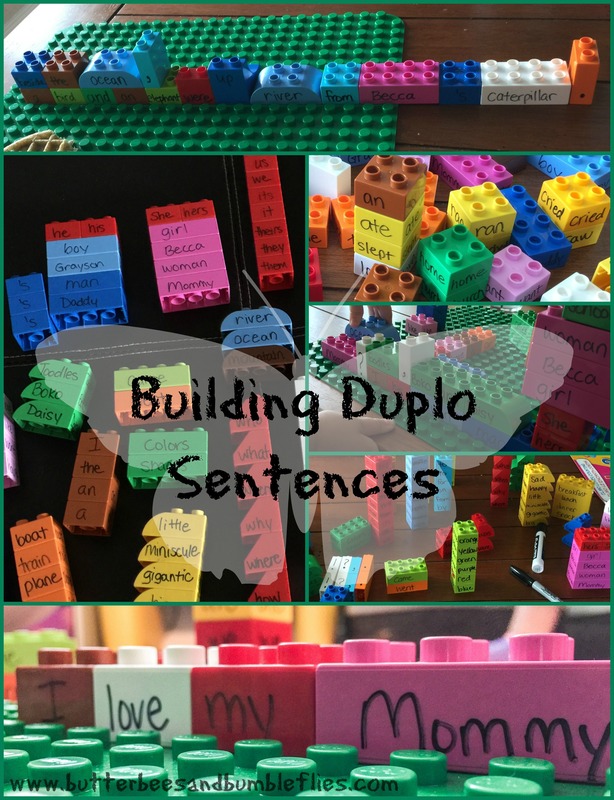 What ideas do you have for fun ways to use Duplos? This post was not sponsored in any way by Lego Duplo… we’re just a family who loves Legos and Duplos and has an overabundance! 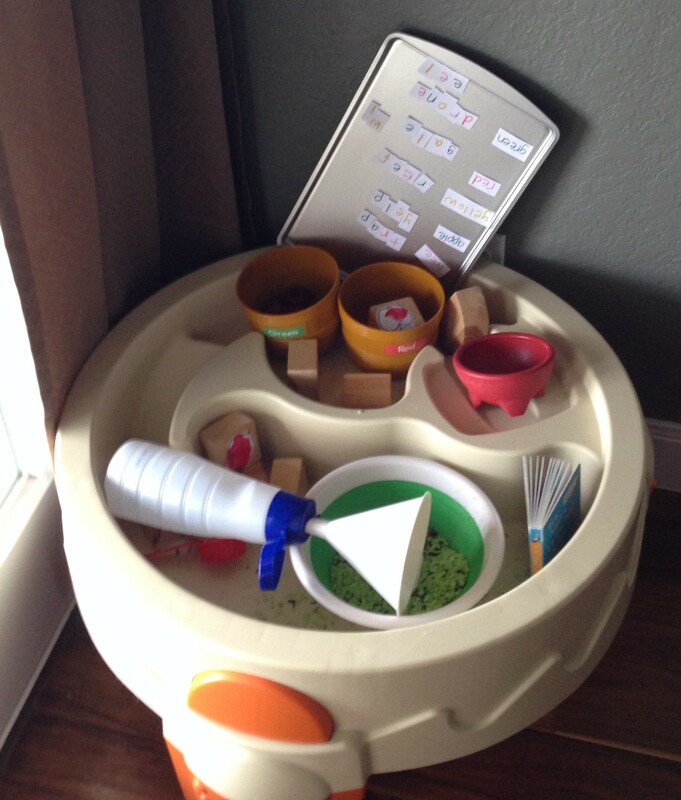 I’m sure I’m not the first to create a post about what you can do with all those little food pouch lids… because I’m sure there are a LOT of parents out there who have them coming out of their ears!!! (I know I shudder to think how many we just threw away before we were saving them… sigh.) So… if your kids eat anything from a pouch, SAVE THE LIDS! These are just THREE of the activities you can do with these – not to mention color sorting, using them for counters for addition/subtraction, etc. 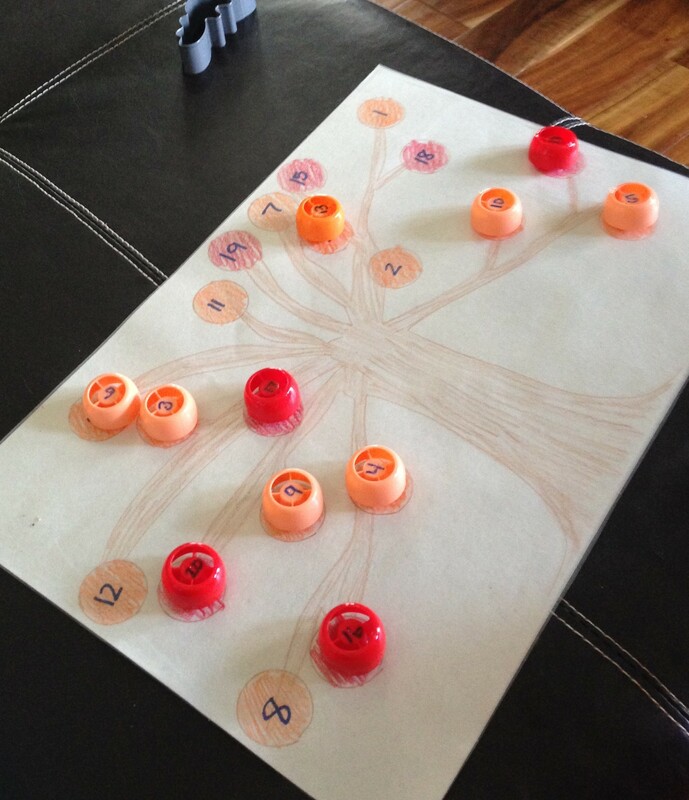 Fall Tree Activity – See my blog post yesterday for this fabulous activity – where your child matches numbers to encourage recognition out of order. And just a side note – you realize you could do any numbers you wanted – it could be 50-70 or 80-100 (although you’d have to write really tiny to fit three digits on the center of one of those lids, you could easily write the number on the side – and go as big as you want!) OR – what about this extension for your older kids? Write an addition, subtraction, multiplication, or division problem on the side of the lid, and they have to match it to the answer on the tree! Again, color coding helps make it a little easier, so if you have two or even three colors of lids that are fall leaf colors, that would be awesome. 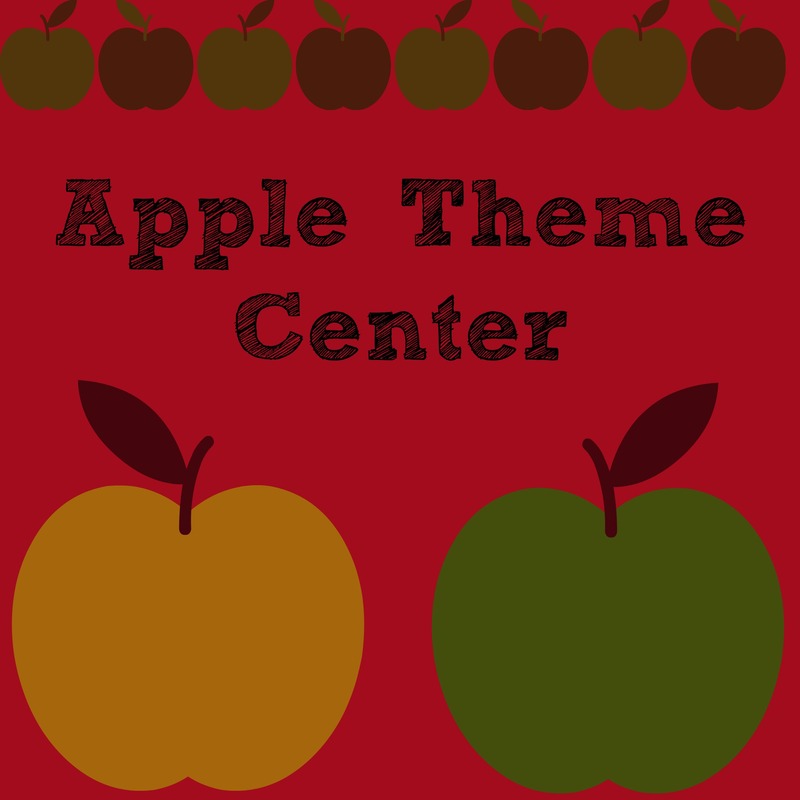 Or, make it more challenging by making all your leaves/pouch tops the same color! 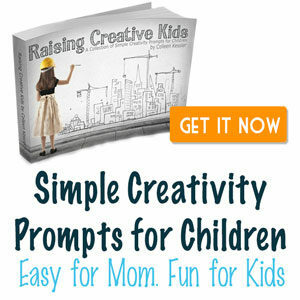 Imaginative Play Activity – Build your family! Did you ever think that you could make people with these little pouch tops? And houses? Becca loves to build with her pouch tops, so one fun activity was to make our family. 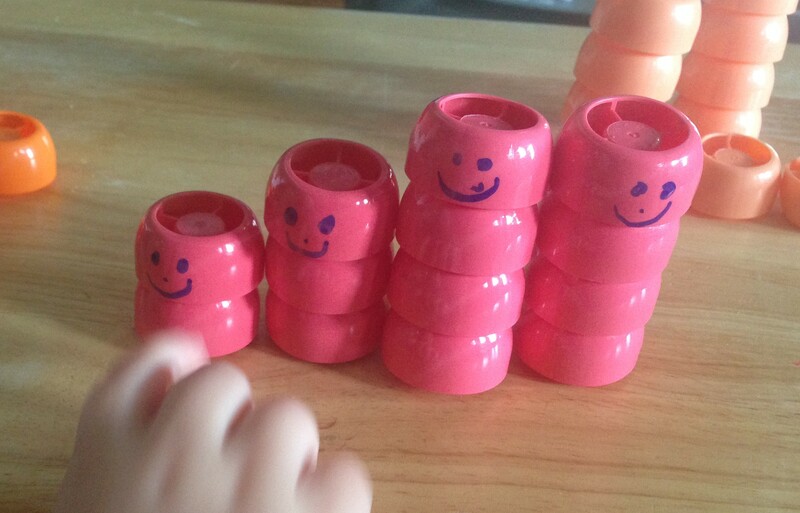 I drew faces on four lids, and then we stacked them up by height to create our family! Now, you could take it a step further and hot glue them together so they could walk around and go into their house, etc. But Becca enjoys building the people over and over. She searches through and finds the faces, and then builds them over and over again. She knows Mommy and Daddy are four pouch tops, she’s three, and Baby Grayson is two. 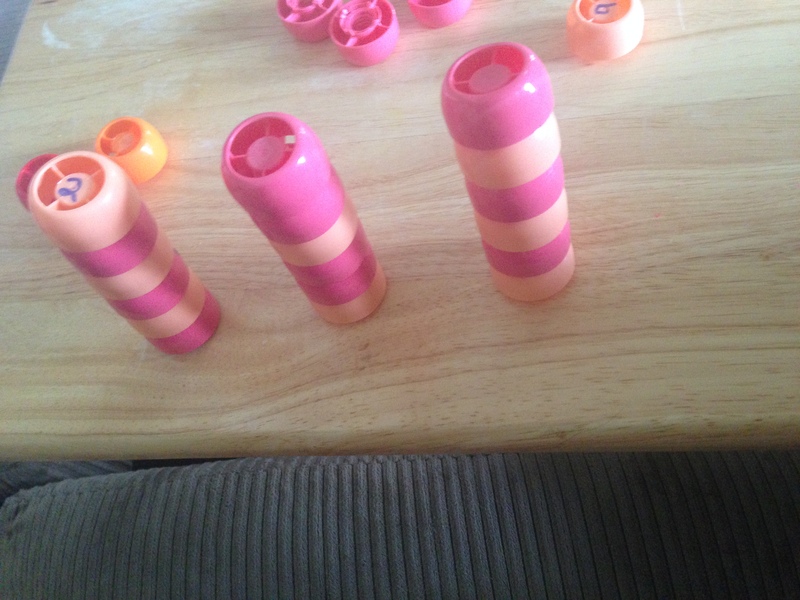 So it makes a great counting activity, but stacking them is also great for her fine motor development – because by the time she has three stacked up, she has to be very careful to not knock them over! She loves building castles and houses for her people, as well! Super fun. Patterning – I think another fabulous thing we have done with these is using them to create patterns. Patterns are all around us in our world, but to recognize and create patterns is an important skill we must first be taught. Becca is a huge fan of patterns – she’s always wanting me to make harder patterns for her to complete. Sadly, she’s only a fan of three or four different kinds of pouches… so we can’t make patterns with very many colors of pouch lids, but that’s ok! We use what we have! If you aren’t familiar with teaching patterns to children, you might be interested to know that once in school, your child will learn to “name” their patterns with letters. You can start coordinating this and teaching your child early to name their pattern. For example, the patterns in this picture are named (L to R, bottom to top) an AB pattern, an ABB pattern, an AB pattern. 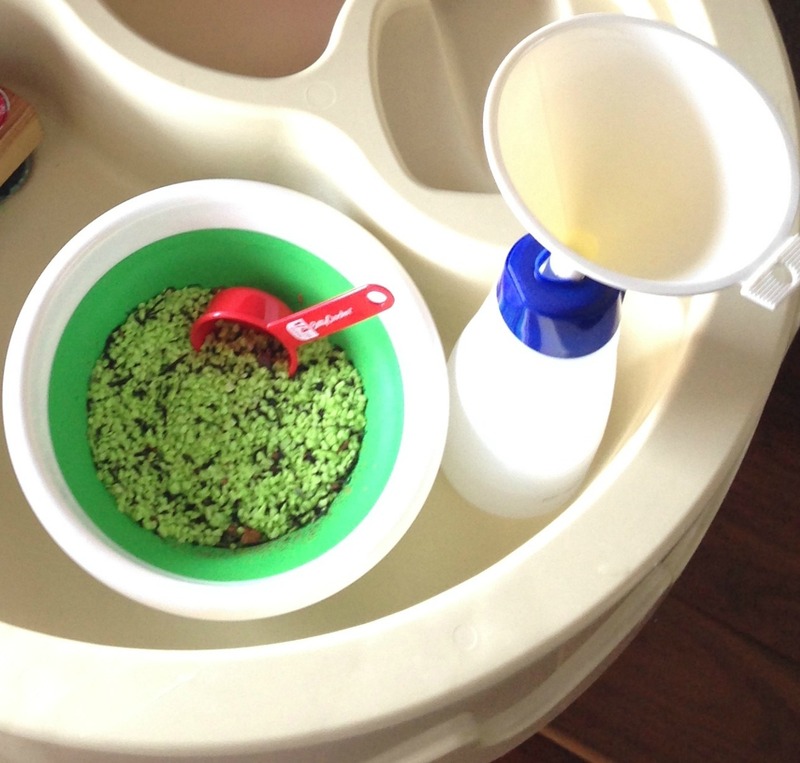 Counting/Ordinal Position/One-to-one Correspondence – I’m always a fan of using REAL LIFE objects to help teach little ones to count. So, it’s as simple as what I did for the fall tree – put the numbers that you want to work on on top of each lid. 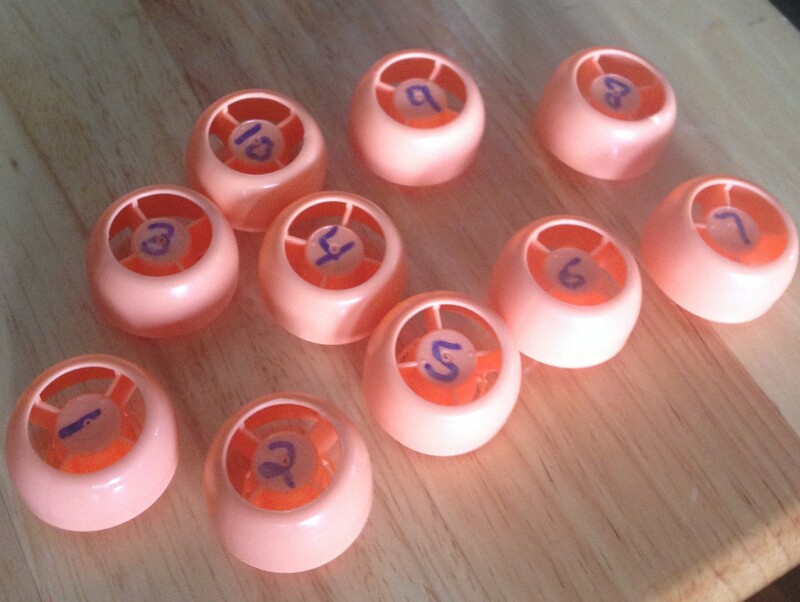 Then your child can use them to make a number line, putting each number in it’s correct spot; they can use the numbers to count the lids and see how many they have; and it’s also helpful for those who like to just keep counting, and struggle with One-to-one Correspondence. Becca used to really struggle with that. There could be four of an item, and she’d put her finger on each of the four and count to four, but then keep touching the items and count however high she wanted to count. She still does that occasionally – with a grin on her face because she knows she’s doing it wrong. What really helped her to understand this concept was to count items that had a number on them. She would touch the number, and say it. When she ran out of numbers, she was done counting. This activity might help your child if he/she struggles with this concept as well. This post contains affiliate links. Thank you for your participation! I’m all about quick, easy ideas that I can throw together in just a few minutes. This center was not one of those ideas. So if you are just starting with sensory activities for your kiddos, this is not the place to start. BUT – any one of these ideas on their own IS a fabulous start. You just might not be ready to put them all together on one day to create a center. This activity has been in my brain for a while, but I hesitated to do it with her because I actually don’t have a set of magnetic letters. And then it hit me – I DO have magnet tape! So, I wrote the words I wanted on index cards, and cut out the letters. Then I stuck tiny pieces of magnet tape on the back! This little sheet tray I got at Dollar Tree in the cooking section. It’s also the perfect size for her little hands to haul out of the center and over the automan or couch for more intense play just focused on this activity. She has begun to try to read the words as sight words, and is doing really well. 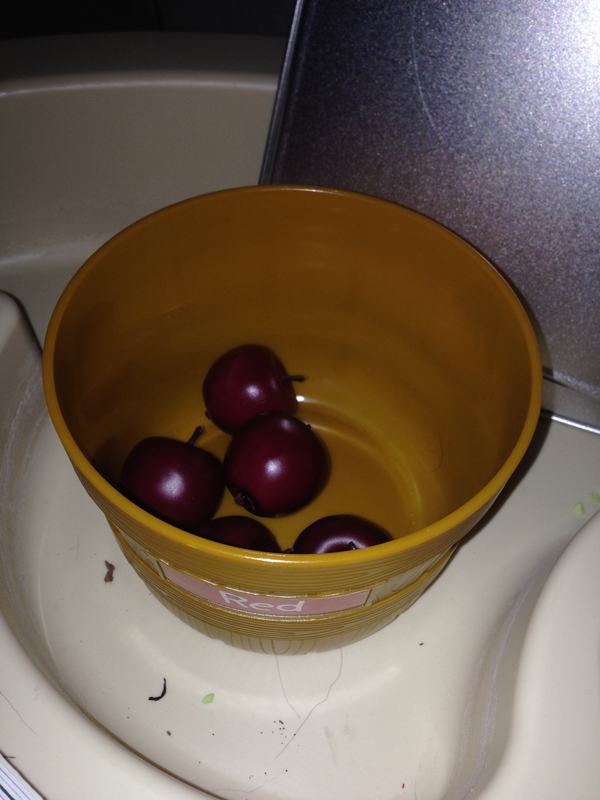 Again with Dollar Tree – I found these little green and red apples in the home decor section, and then I pulled the red and green buckets from her Farmer’s Market Set (Get Yours Here – Aff Link ) and she can sort them. 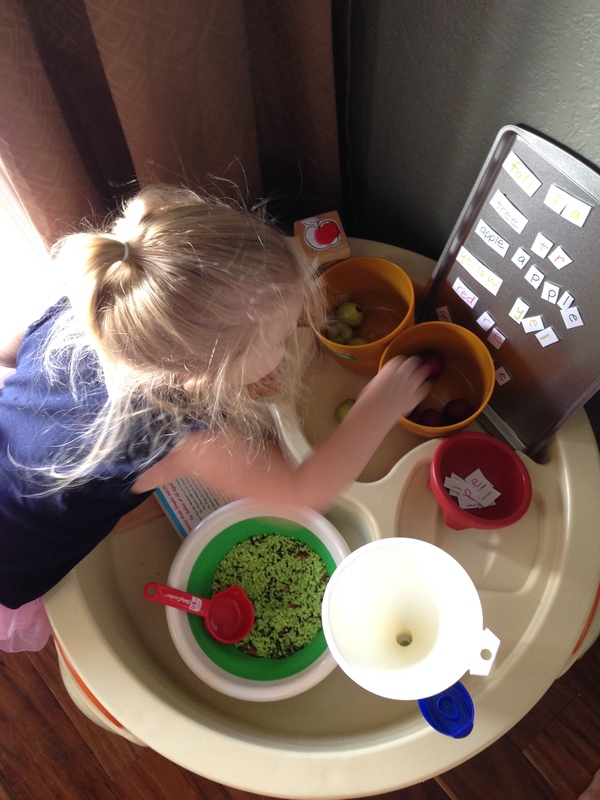 She has also enjoyed setting the bucket on the ground and stepping back to toss the apples into the correct bucket – making it a great gross motor activity, as well. We LOVE the book Ten Apples Up On Top. So when I saw this idea from Ellen over at Cutting Tiny Bites, I just new we HAD to do it. Here’s how we extended her activity a tad. I printed up this sheet (FREE PRINTABLE HERE!) of ten apples, and let Becca paint them. (I had planned to do red, green, and yellow, and then discovered we were out of paint. So that might be an extension you’d want to add.. so that as you build, you can build a pattern!) After they had dried, I cut them out and taped them onto ten blocks. We only had nine that matched, so the tenth one is the “roof,” as Becca calls it. 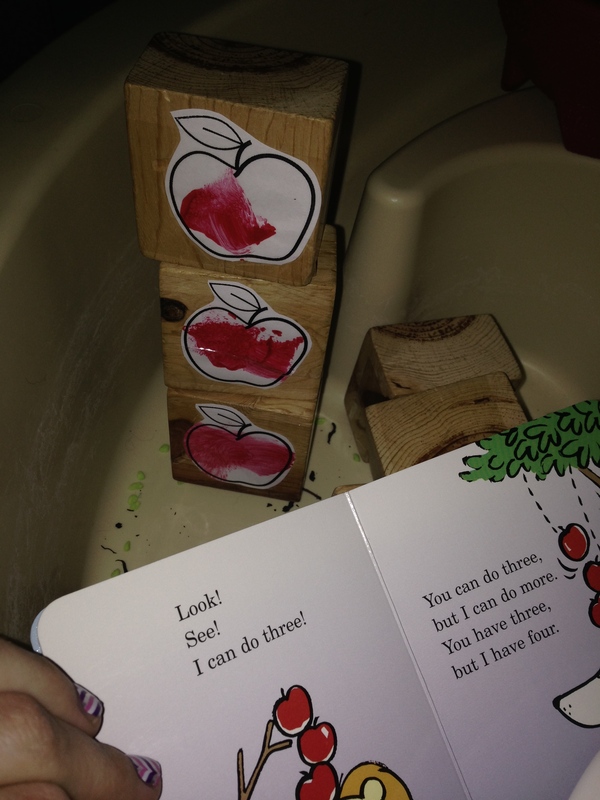 So here’s how you do it – as you read the book, you stack an apple block on top each time that the animals in the book add an apple. It’s super fun. 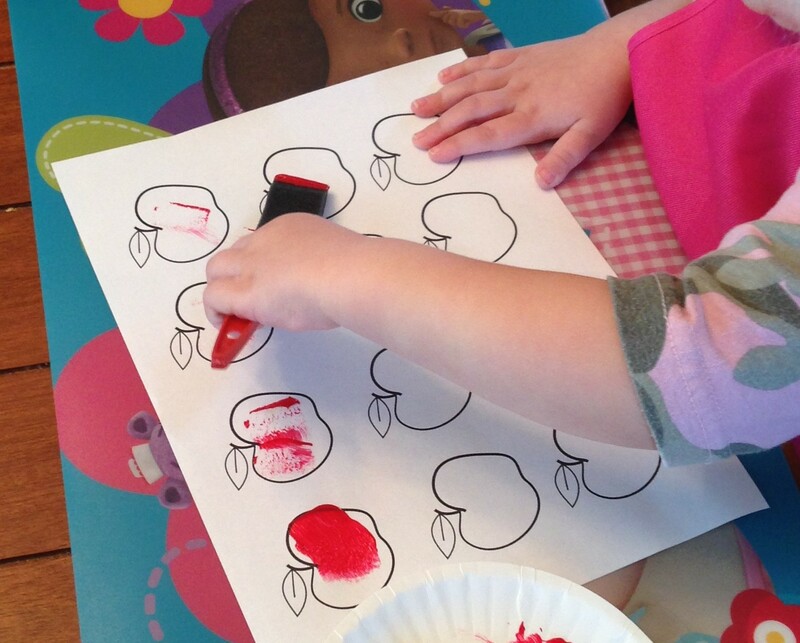 Although if you pick a heavy top block like we did, you’ll end up with all ten apples up… and then dropping. But, that just adds to the fun! 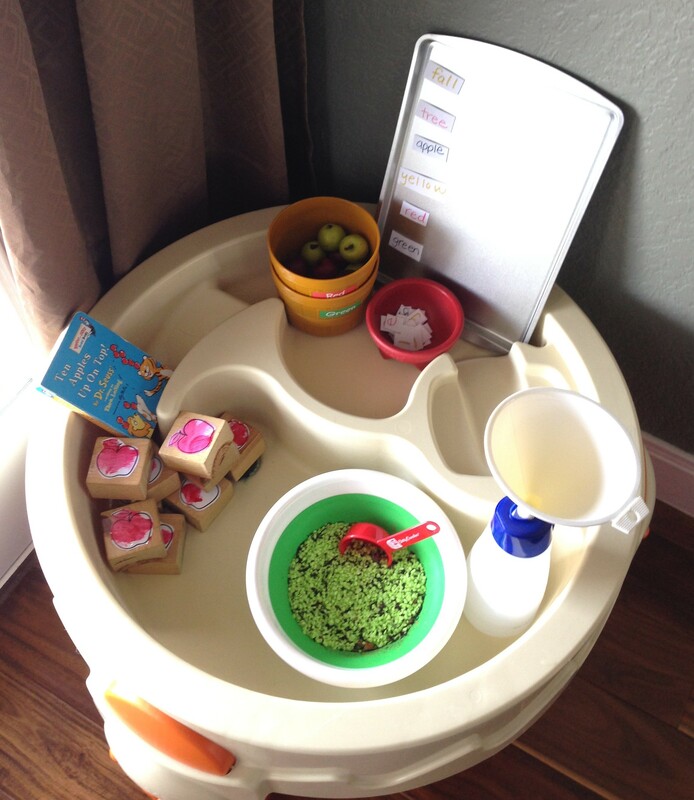 Total Mommy Prep Time: All told, it probably took about an hour to put it all together – maybe a little longer? Total Becca Play Time: She spent about 45 minutes here the first day, and has easily spent 15 minutes every day since then on these activities. VERY beneficial and well worth my time to put it together!